When configured and installed properly, metal roofing can last as long as fifty years or more, requiring very little maintenance and looking beautiful all the while. Installation of reflective metal roofing can save your home up to 40% in summer cooling energy costs. Metal roofing offers a wide range of design possibilities, each with its own design aesthetic, from the clean & distinctive look of standing seam to metal shakes & shingles. There is no material more capable of protecting a structure from wind, rain, hail, fire or rot than a durable metal roof. You may not have heard the phrase standing seam roof before, but you have seen them before. The first standing seam roofs originated hundreds of years ago, when colonists needed a durable roofing material for important buildings, such as government buildings. While you most commonly see it on commercial buildings today, standing seam roofs in Tulsa and Kansas City are showing up on more houses every year, with 46 percent of residential metal roofing projects using this option. Want a rustic look for your home or business? How about something sleek and modern? Or perhaps you prefer a California-style vibe. 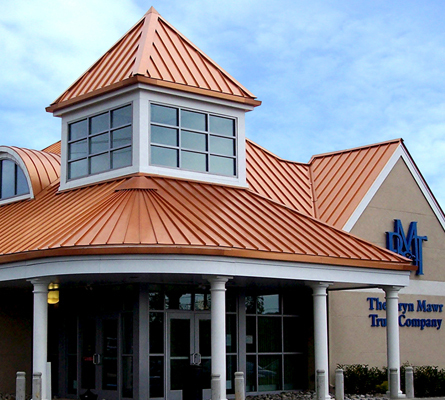 Metal roofing systems are incredibly versatile allowing your roof to represent your personal style. One of the best reasons to install a metal roof is the amount of cash it can save you over time. Not only do they last significantly longer than traditional roofs, they cost about the same. Also, you can save up to 50% on your energy bill every month and 25% on your homeowner’s insurance every year. Metal Is Better! We are pleased to be a full-service roofing company providing all roofing systems for today’s home and business owners. Our name may say “Metalsbetter” but that certainly does not mean “metal only”. We love metal roofing but have installed hundreds of traditional roofing systems. We offer competitive pricing and quality craftsmanship, in fact we are known for it. There are an increasing number of options for roofing systems and we provide homeowners with multiple options such as a side by side comparison of metal vs. shingle. This allows the customer to see the facts when considering what system they prefer in style, price and benefits. We are certified Certainteed, ShingleMasters, as well as Tamko certified which insures that each and every shingle roofing system we provide is backed by time tested, high quality products by reputable manufacturers, installed by highly trained professional installation teams.